PHP 7.3 is knocking on our door and with it comes new useful features, functionalities, deprecations, and a good number of bug fixes. This release is all about web developers. 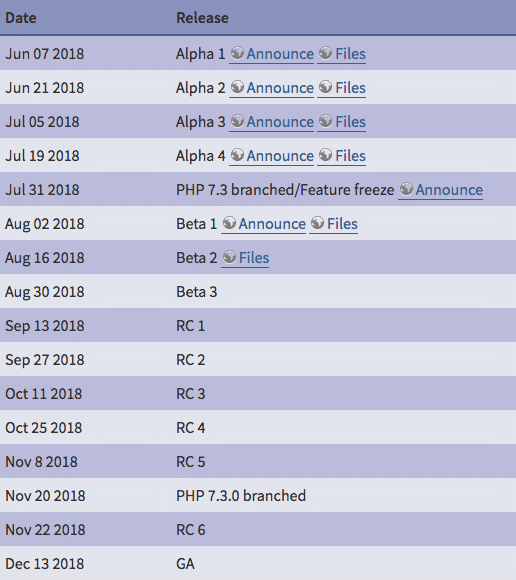 The current Beta 2 version was released on August 16, coming perfectly on time with the PHP 7.3 timetable. You can download the current PHP 7.3 version for your development and testing, but keep in mind that, this shouldn’t currently be used in production environments. In this post, we’ll provide an overview of the features and changes that we personally consider most relevant. But you can always check the full list of features, changes and bug fixes in PHP 7.3 upgrade notes and PHP 7.3 Requests For Comments. What’s new in PHP with PHP 7.3? This is probably one of the most relevant improvements coming with PHP 7.3, and we think it deserves a little more attention. So, before diving into PHP 7.3 heredoc/nowdoc changes, we’ll provide a quick overview of this useful core feature. If you are already confident with nowdoc and heredoc, feel free to jump to the PHP 7.3 changes. The marker must follow the same naming rules as any other label in PHP: it must contain only alphanumeric characters and underscores, and must start with a non-digit character or underscore. It is very important to note that the line with the closing identifier must contain no other characters, except a semicolon (;). That means especially that the identifier may not be indented, and there may not be any spaces or tabs before or after the semicolon. It’s also important to realize that the first character before the closing identifier must be a newline as defined by the local operating system. This is \n on UNIX systems, including macOS. The closing delimiter must also be followed by a newline. It’s clear enough that heredoc and nowdoc syntaxes are quite restrictive, but PHP 7.3 may change this a little with the following improvements. The indentation of the closing marker sets the amount of whitespace (or tabs) that will be stripped from each line of the body. But be careful: the closing marker should never be indented further than any other line of the body. Stripping tabs and whitespaces allow us to indent the body of the heredoc/nowdoc to the same level of the code around, and without unnecessary whitespace before each line of the body. We can use both tabs and spaces for indentation, but we are not allowed to use them intermixed. This means that we must use the same indentation characters for the closing marker and any lines of the body. In case of different indentation characters, we’d expect a different type of parse error (invalid indentation). Anyway, be careful when choosing the name of your marker because “occasionally” you may expect an error if it matches a word you used in the body of the heredoc/nowdoc (read more on this on the RFC and GitHub). Both proposals passed with more than 2/3 votes. Trailing commas (or “final commas”) are commas appended to a list of elements, parameters or properties and they come in handy in contexts where new values are appended frequently because they prevent errors due to a missing comma. In PHP trailing commas are allowed in arrays, and as of PHP 7.2 they are allowed in grouped namespaces. Trailing commas will be allowed in method calls and enclosures, as well. Note: This change would affect function calls only. Function declaration syntax will not change. Moreover, free-standing commas, multiple trailing commas, and leading commas will not be allowed. Additional examples can be found on the RFC page. This RFC passed with a 30 to 10 vote. One of the most appreciated functionalities coming with PHP 7.3 provides a new way of handling JSON errors. This is not a core feature, but an addition to the JSON extension that would change the error behaviour of json_decode() and json_encode(). json_encode() returns FALSE on error. This is clearer because there is a specific error value. Anyway, both functions neither halt program execution on error, nor throw any warning. This RFC instead proposes adding a new option flag value for json_decode() and json_encode(), JSON_THROW_ON_ERROR. When passed this flag, the error behaviour of these functions is changed. The global error state is left untouched, and if an error occurs that would otherwise set it, these functions instead throw a JsonException with the message and code set to whatever json_last_error() and json_last_error_msg() would otherwise be respectively. Throwing an exception upon error would give several advantages that you’ll find listed on the RFC. Note: an invalid depth parameter passed to json_decode() outputs a warning and returns NULL. This behaviour will not be affected by JSON_THROW_ON_ERROR. Similarly, parameter parsing errors are not affected by JSON_THROW_ON_ERROR and continue to produce warnings. This proposal passed with 23 to 0 votes. What Does Reference Assignment Mean? The list() language construct can be used to “assign variables as if they were in an array”, but with list() we are not currently allowed to assign variable values by reference. The advantage of this proposal is that we could now assign multiple variables by reference, which was not currently allowed. More examples are available on the RFC. This proposal passed with 17 to 7 votes. This proposal passed with 25 to 0 votes. Currently, we can retrieve the first and the last key of an array by using reset(), end() and key() functions. Unfortunately, with these functions, there’s no way to gather the first or the last index of an array without changing its internal state. Other options usually reduce code readability and performance. As of PHP 7.3, array_key_first() and array_key_last() allow to retrieve the first and the last key of a given array without affecting the internal array pointer. These new functions would allow us to write less complex code and in some cases avoid errors. See the RFC for further information and several examples. array_key_first() and array_key_last() have been approved with 18 to 14 votes. Note: the original RFC proposed two more functions, array_value_first() and array_value_last(), which were voted in a different poll, but haven’t been approved and won’t become parte of PHP core. Argon2d maximizes resistance to GPU cracking attacks. It is faster and uses data-depending memory access. Argon2i uses data-independent memory access, which is preferred for password hashing. It is slower as it makes more passes over the memory to protect from tradeoff attacks. Argon2id is a hybrid version that combines the Argon2i approach for the first pass over memory, and the Argon2d approach for subsequent passes. Argon2id is recommended on the Internet, except when there are good reasons to specifically prefer another variant. More information and examples on the RFC. The following functions/functionalities will be deprecated with PHP 7.3 and removed not later than PHP 8.0. The image2wbmp() function outputs or save a WBMP version of a given image. This function takes three arguments: an image resource, a filename (the path to the saved file), and a foreground color. As of PHP 5.0, it is identical to imagewbmp(), so this RFC proposes to deprecate and remove it. Since PHP 7.3, each call to image2wbmp() would issue a deprecation warning. After the removal, each call would throw a fatal error. PHP currently supports both case-sensitive and case-insensitive constants. Anyway, case-insensitive constants are supported but considered subject to inconsistencies in functionalities and to be complex to use. A constant is case-sensitive by default. By convention, constant identifiers are always uppercase. Deprecate and Remove Case-Insensitive Constants. Here is a quick list of functionalities being deprecated in PHP 7.3. It’s not exhaustive, they’re just the deprecation proposals I personally consider more relevant. For a full list of proposed deprecations, see Deprecations for PHP 7.3. Undocumented mbstring function aliases: there’s a number of undocumented mbstring function aliases that are duplications of equivalent functions using mb_prefix. For example, mbereg is an alias of mb_ereg. All these functions would be marked as deprecated and a deprecation notice would be thrown when they are encountered during compilation. In PHP 8.0, the deprecation warning should be removed and the needles should be automatically converted into strings. On the other hand, these functions seem to be of very little utility. strip_tags() itself, due to its limitations and known bugs, already has very few legitimate applications. There is no need to provide native support for streaming application on top of that. So the RFC proposes to mark fgetss(), gzgetss() and SplFileObject::fgetss()as deprecated. What Does PHP 7.3 Mean for WordPress Users? According to the official WordPress Stats page, as of writing this, only 32.9% of WordPress users have upgraded to PHP 7 or higher. Just 4% are using PHP 7.2. You can see that a large majority of users, over 38%, are still running on PHP 5.6. What’s even scarier is that over 28.5% of users are using unsupported PHP versions. As of December 2016, WordPress.org actually bumped up their official recommendation for users from PHP 5.6 to PHP 7 or greater. Official PHP benchmarks show that PHP 7 allows the system to execute twice as many requests per second in comparison with the PHP 5.6, at almost half of the latency. Christian Vigh also published a PHP performance comparison in which he found that PHP 5.2 was 400% slower than PHP 7. Kinsta, one of our preferred hosting companies, ran their own performance benchmarks in 2018 with PHP 5.6 vs PHP 7 vs HHVM. And similarly to the benchmarks above, we saw that PHP 7.2 could execute almost three times as many transactions (requests) per second as compared to PHP 5.6. Many are slow to update simply because of the time involved with testing new all their third-party plugins and themes to ensure they function properly. But a lot of times, it comes down to they simply haven’t done it yet. Not sure what version of PHP you’re running? One of the easiest ways to check is to use a tool like Pingdom or Google Chrome Devtools. The first HTTP request header will typically show you the version. This relies on the host not modifying the X-Powered-By header value. If they do, you might not see your PHP version, in which case you would need to upload a file via FTP. Or you can always reach out to your host and ask. PHP 7.3 isn’t quite out yet, but once it is you can start testing. You could test your WordPress site locally or check your scripts in an environment like Docker, which allows you to test different versions of PHP from the command line. Or you can utilize a staging environment, as this will more closely resemble a live production site. Our proreffered hosting partner, Cloudways, will be releasing PHP 7.3 as soon as it’s available and has been fully tested. Another hosting company we use, Kinsta, will be the first to launch it. Simply change the PHP Engine for the staging site under “Tools” and you can start testing to ensure compatibility of your third-party plugins and themes. Once you confirm everything works, you can either change your production site over to PHP 7.3. We partner with forward thinking brands for the demands of a digital world.